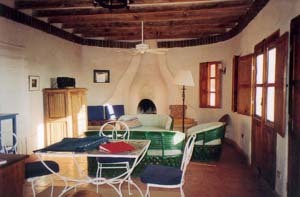 Located midway up the hill from the main square, this light and airy two-bedroom, two-bath home is the perfect place to relax, read a book while dozing in a hammock underneath the mesquite tree in the large garden, or simply do nothing but watch the fish feed in the hyacinth roots of the outdoor water cistern. 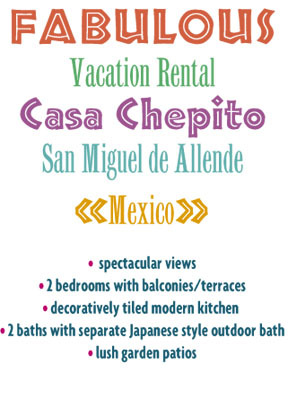 From Casa Chepito it's ten minutes on foot down to the main square, ten minutes up to the Jardin Botanico, Mexico's largest botanical garden, and minutes away from more than 800 miles of some of the best mountain biking trails in Mexico. 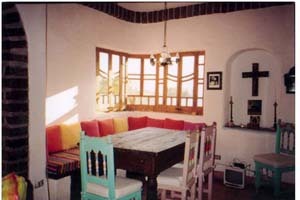 Adjacent to the historical landmark orchid farm, Casa Cheptio is both near and far, convenient but quiet and private. 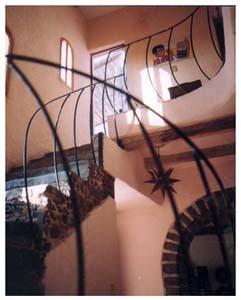 There are fireplaces (gas) upstairs and down, an open-air yet private Japanese bath, a well furnished and fully tiled kitchen, antique and folk art furnishings, and two front-suspended mountain bikes for use by guests. The Maid and gardener come three times a week, and a cook is available to shop and prepare all of your meals for a nominal extra charge. 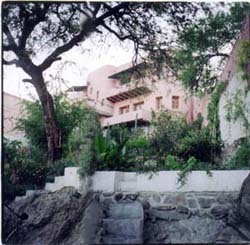 The house has a high speed internet connection, cable TV, VCR stereo, FAX, washing machine, fully equipped kithchen. It is fully furnished, including towels and linens. | site by: Immortal Webs | ..::Back to Jeff Spurier.com::..